In the Court of Flowers, the colonnade encircling the entire length of its oval is bordered by Corinthian columns arranged in pairs. The smoked-ivory tone is used throughout, except in the portals, where Sienna marble gives a deep note of color. The highly ornamental floral light-standards between the columns occur elsewhere throughout the court. The cornice is edged with red Spanish tiles and above the colonnade runs a richly decorated loggia that, with its suggestion of southern influences, enhances the warm, sunny atmosphere of the court. The repeated figure of the flower-decked and garlanded "Flower Girl" is by A. Stirling Calder. A conventionalized frieze in delicately colored arabesque runs between the balcony and the columns, the prevailing motif of which is the griffin. The colonnade is broken by three portals, opening respectively into the Palace of Manufactures on the west, the Palace of Varied Industries on the east and the Court of Ages on the north. 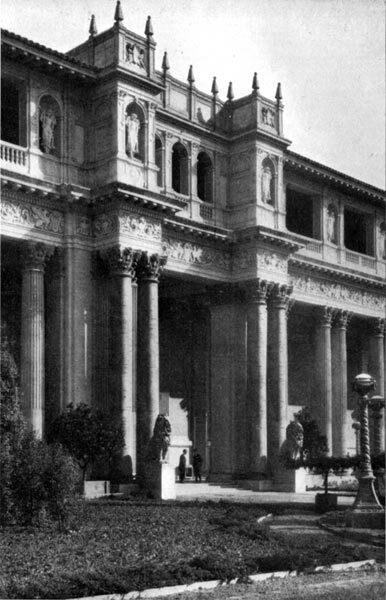 These entrances, while they do not interrupt the colonnade below, as is the case in the Court of Flowers, are made the keystones of the ornament of the upper balcony, where the triple arches, with their decorative treatment, furnish an effective break in the loggia.